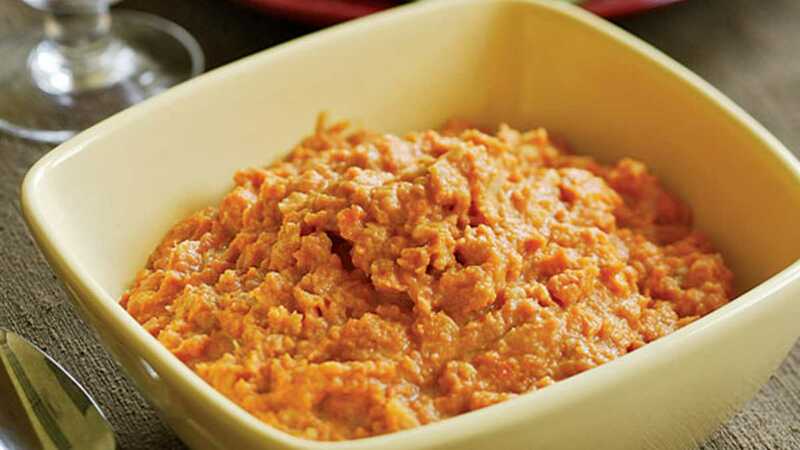 This mashed sweet potato recipe is a great partner for pork, duck and all kinds of game. The touch of molasses really deepens the flavor but doesn't become cloying. 1. In large saucepan, combine potatoes, carrots and parsnips; cover with cold water. Bring to a boil, add a dash of salt; simmer until tender, 15–20 minutes. Drain; return to pan. Set pan over low heat, uncover and let vegetables dry in pan for two minutes, shaking pan occasionally so they don't stick. 2. Pass vegetables through food mill or mash by hand. Stir in butter, sour cream, molasses, ginger and half-and-half. (If you prepare potatoes ahead, save 2 tablespoons half-and-half for reheating). Add ½ teaspoon salt and pepper, and serve. From Cooking New American: How to Cook the Food You Love to Eat by the editors of Fine Cooking. Reprinted with permission from Taunton Press Copyright © 2004. Photograph copyright © Taunton Press.